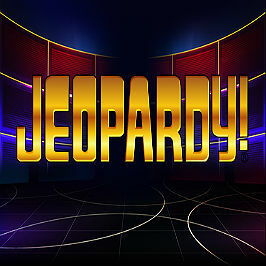 Most of us know the US TV quiz show Jeopardy! if only from references in movies such as Rain Man. If you've ever wanted to try your hand at winning big but never got the chance to make it to the small screen, this slot from IGT gives you the next best thing, and with some decent winnings to match. A 2,000-coin jackpot is possible, and the bonus game can add even more to your pot if lady luck is with you. In a nod to the show, this slot has a slightly different play style – there are no reels. Read on to find out just what that means for your chances. Play Jeopardy! for Real Money! Jeopardy! has been played and watched all over the world. It's a much-loved TV game show where contestants can go home with cash prizes if they correctly phrase the question to the answer they've been given. “Chelsea.” “Who won the Premier League in 2014/15?” “Correct!” Iconic of American TV in the 80s and 90s, this slot faithfully recreates that quiz show kitsch feel, and even features the original soundtrack. 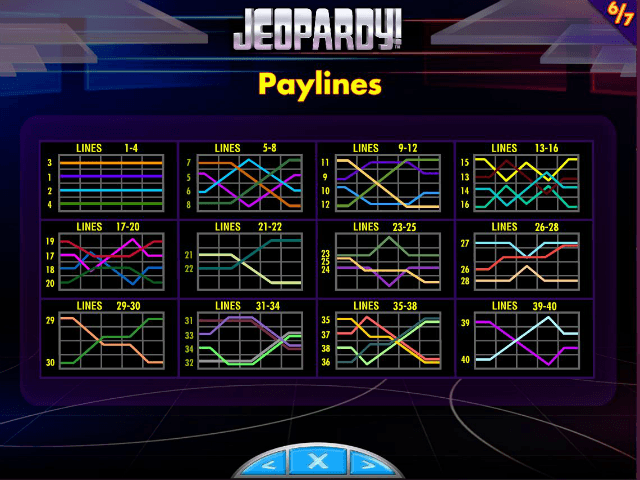 The overall graphics style of the Jeopardy! online slot is reminiscent of the garish sets, so there are plenty of bright blues, yellows and pinks. It's not overcrowded though, and you can still see everything you need for an informed game. The symbols themselves can get a little busy visually, as they represent the various cast of the TV show as well as more traditional symbols. While the Jeopardy! slot machine is a standard five-reel slot, with a generous 40 paylines, it does have a few features that set it apart. The symbols are a mix of the quiz show faces, as well as the emblems for different question topics such as sport, film, science and so on. While the large number of paylines is good for your odds, it's worth noting that it does have a slightly lower return to player ratio than some other slots. That means that if you want to win big, you need to play the bonus mode, activated by an extra bet of 20 coins per game. The bonus modes can bump up your pot though – this is where it makes up for the slightly lower return, as we'll look at below. 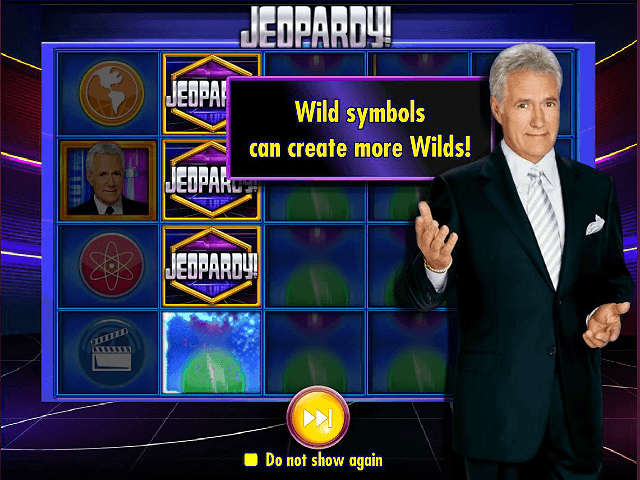 One symbol you'll want to look out for is the wild – this is the name of the game itself: 'Jeopardy!'. One of these on any of your reels gives you a chance at creating even more wilds. These can help you make the winning matches, and can appear on free spins. The 'Bonus' scatters can give you some very good bonuses too (perhaps not surprisingly, given the name). Four scatters on the third column rewards you with a whopping 19 free spins and a 12-times multiplier. As you can see, while the standard returns could leave you feeling a little disappointed, sticking around for the bonus rounds is what it's all about with this slot. Fitting, because this element of risk and chance are essential to the TV classic itself. Share this Jeopardy! Review today! 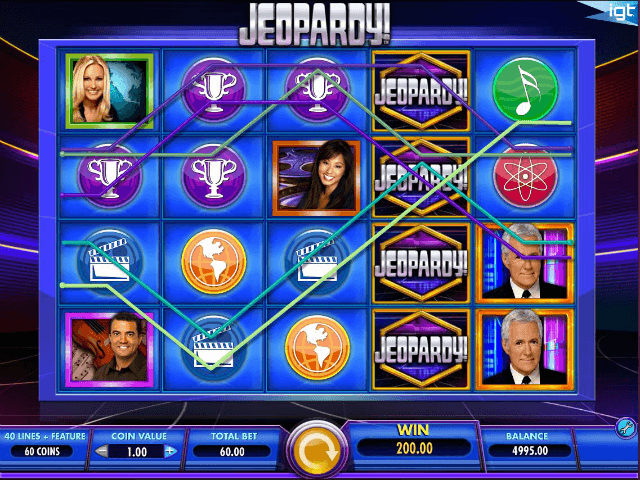 If you like Jeopardy!, you'll love these slot titles too!